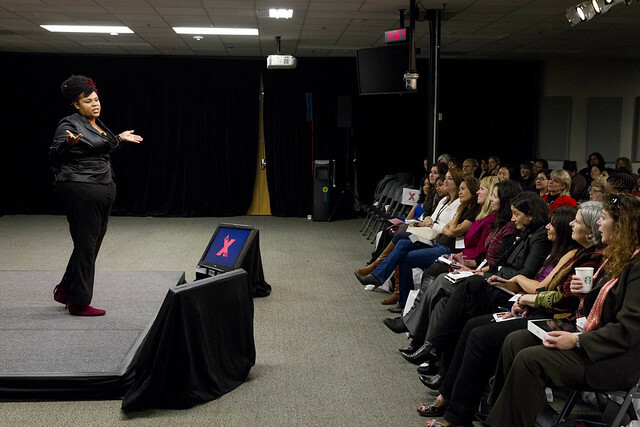 Desiree was one of many speakers at the TEDxBayArea Global Women Entrepreneurs Event held on December 1st at the LinkedIn Headquarters in Mountain View, CA. The event featured talks by inspirational women and men encouraging women entrepreneurs to dream big and take risks. Arezoo Miot, TechWomen Program Officer, attended the event to connect with the local community of women entrepreneurs. One of the main focuses of the event was to encourage women entrepreneurs. A number of the featured presenters spoke about the importance of following dreams, being persistent and believing in onesself in the face of adversity–all qualities the TechWomen program is looking for when selecting participants. This year, the TechWomen program is placing an even bigger emphasis on finding candidates who have demonstrated entrepreneurialism and innovation in their careers and/or communities. The TechWomen program has inspired its 2011 and 2012 participants with this same message and will do so again in 2013 for participants from Africa and the Middle East. Arezoo noted that TechWomen is becoming a well-known name in the local women entrepreneur community. A number of people involved with the TechWomen program attended the event; Francine Gordon, 2011 and 2012 TechWomen mentor, was one of the event’s co-organizers, and other TechWomen mentors such as Laura Yecies, Shannon McElyea and Lucie Newcomb could be found amongst the crowd. It was not just in the Bay Area that TechWomen were present. TechWomen from other parts of the world had the opportunity to attend and speak at their local TEDxWomen Event. 2012 Emerging Leader Rajaa Khouimi talked about her TechWomen experience at the TEDxWomen event in Rabat, Morocco, where she spread the word about the program and encouraged eligible applicants to apply for TechWomen 2013. TechWomen is looking forward to receiving applications from inspiring candidates. The deadline for the 2013 Emerging Leader application is February 22nd, 2013. To apply, please visit www.techwomen.org.